The Emerging Nations World Cup was yesterday confirmed to be held in Sydney in 2018. The event was originally planned to be held alongside this year’s Rugby League World Cup but was controversially blocked in January. It will now take place in Western Sydney with games to be played across two weeks at Windsor, St Mary’s and Cabramatta. The RLIF has provided a grant of $100,000 for tier 2 and 3 nations to compete at the tournament. The competition will also give regional teams such as the Latin Heat, Africa United and Scandinavian Vikings to partake. It is third staging of the concept, having previously been held in 1995 and 2000. Already Greece, Hong Kong, Hungary, Latvia, Malta, Niue, Philippines, Thailand and Vanuatu have been confirmed to compete while Canada will also participate off the back of the Toronto Wolfpack’s success in their maiden League 1 season. More teams are expected to be invited as the tournament comes closer. Wood asserted that there will be plenty to look forward to, “The reason many of us love rugby league is because it’s open to everybody. In addition, the RLIF also recommended the Federazione Italiana Rugby League (FIRL) become a full member of the RLIF. They will be one of 14 nations competing at this year’s Rugby League World Cup to be held in Australia, New Zealand and Papua New Guinea after gaining qualification with a win over Russia. 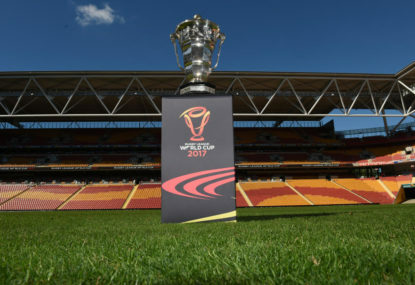 With expansion to 16 teams ahead of the 2021 Rugby League World Cup, the RLIF also signalled changes to the qualification process. Seven teams will qualify from Europe, with 6 from the Asia-Pacific, 2 from the Americas and one from Middle East-Africa. It has also been confirmed that England will tour Australia and New Zealand in 2019 which may be complemented by a Nines World Cup with a full report to be made at their May meeting. Meanwhile, in Turkey, the Kadikoy Bulls were crowned the inaugural Turkish Rugby League Association Premiers on the weekend with a 68-14 victory over Eskisehir Aqua in Istanbul.